It’s happening. 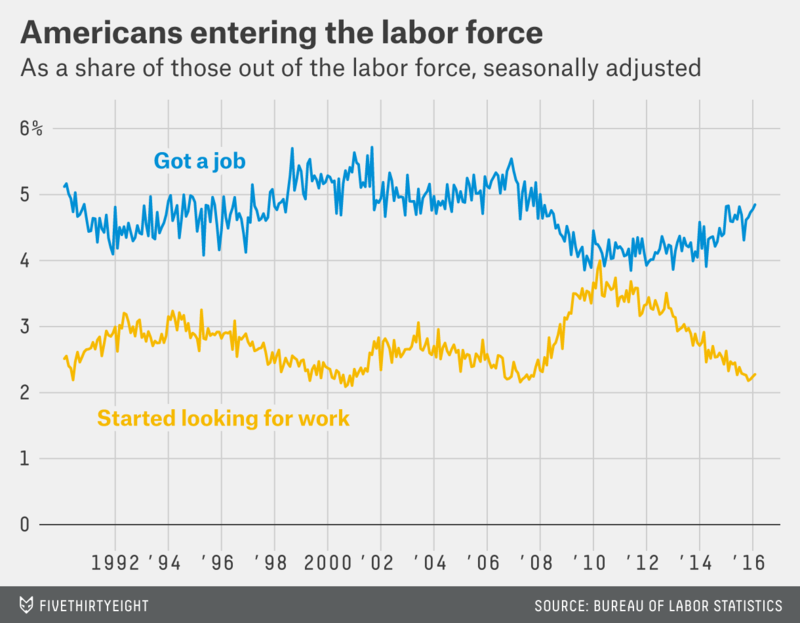 The improving job market is drawing Americans back into the labor force. The U.S. labor force grew by 555,000 people in February, the Bureau of Labor Statistics said Friday. It was the biggest one-month increase in more than a year and, more importantly, was the fifth straight increase, the longest such streak since the recession began more than eight years ago. The labor force participation rate — the share of the adult population that’s either working or actively looking for work — rose two-tenths of a percentage point to 62.9 percent, its highest level in over a year. Some caution is in order here. The monthly labor force data is noisy, and the participation rate has risen before during the recovery, only to dip down again a few months later. The latest rebound has been longer and stronger than those short-lived upticks, but it’s still possible that it could fade. But assuming the rebound is real, it’s hard to overstate how important this trend is for the U.S. economy. Labor force participation has been a dark cloud hanging over the economy in recent years, even as other job-market indicators have shown steady improvement. The share of Americans working or looking for work plunged in the recession as people abandoned job searches in the face of overwhelming odds. 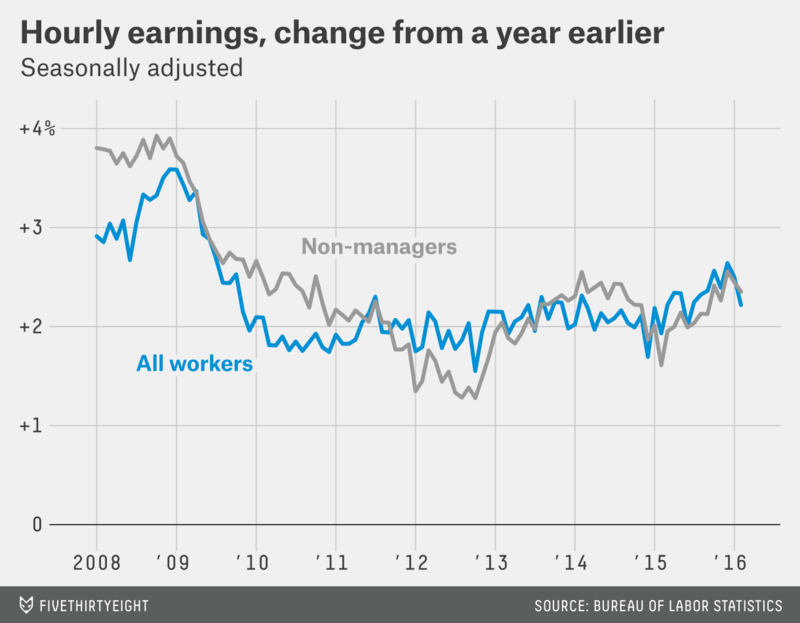 The rate kept falling even as employers started hiring again. 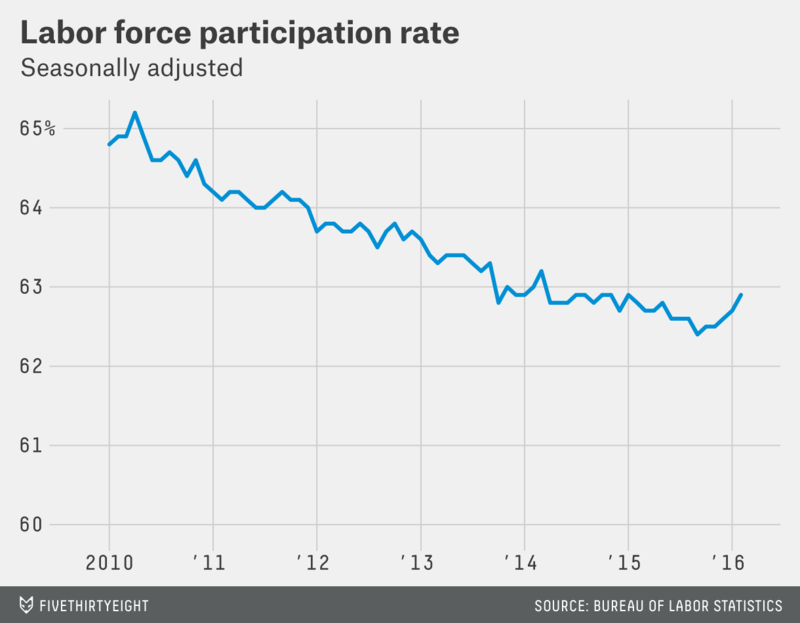 In September, the participation rate hit 62.4 percent, its lowest level since 1977. The decline was partly due to demographics; tens of thousands of baby boomers are retiring every month, pushing down the overall participation rate. But even after adjusting for the aging population there are still millions more people neither working nor looking for work than when the recession began. Many experts feared they would never come back. The recent rebound, however, suggests that the improving labor market — the unemployment rate held steady at 4.9 percent in February — is encouraging Americans to come off the sidelines. That supports some economists’ contention that there is a large pool of potential workers who aren’t formally part of the labor force right now but who would be willing to work under the right circumstances. Betsey Stevenson, a University of Michigan professor and until recently a member of the president’s Council of Economic Advisers, has long argued that the line between in and out of the labor force is fuzzier than some economists often make it sound. A stay-at-home mom, for example, might not be looking for a job, but if she hears from a friend that a company is looking for someone with her skills, she might apply. Sure enough, most of the people entering the labor force have a job already lined up; relatively few are joining to look for work. There is one downside to a growing labor force: If more people start looking for work there will be more competition for available jobs, holding down wages. Average hourly earnings fell by three cents in February, and the year-over-year rate of growth dropped to 2.2 percent, the slowest pace since last summer. Wages are volatile, and it would be a mistake to read too much into one month of disappointing numbers (earnings growth was strong in January), but the increase in labor participation suggests wage growth could remain muted. Still, there’s no question that a growing labor force is good news on balance. In the short run, a larger pool of available workers means that job growth can continue without the economy overheating and driving up inflation. And over the long run, a higher participation rate should boost economic growth because more people are contributing to the economy. Strong job growth: Employers added 242,000 jobs in February, ahead of both the prior month and economist’s expectations. The government also revised up its estimate for hiring in December and January. Altogether, the U.S. has now added jobs for 65 straight months, the longest streak on record. 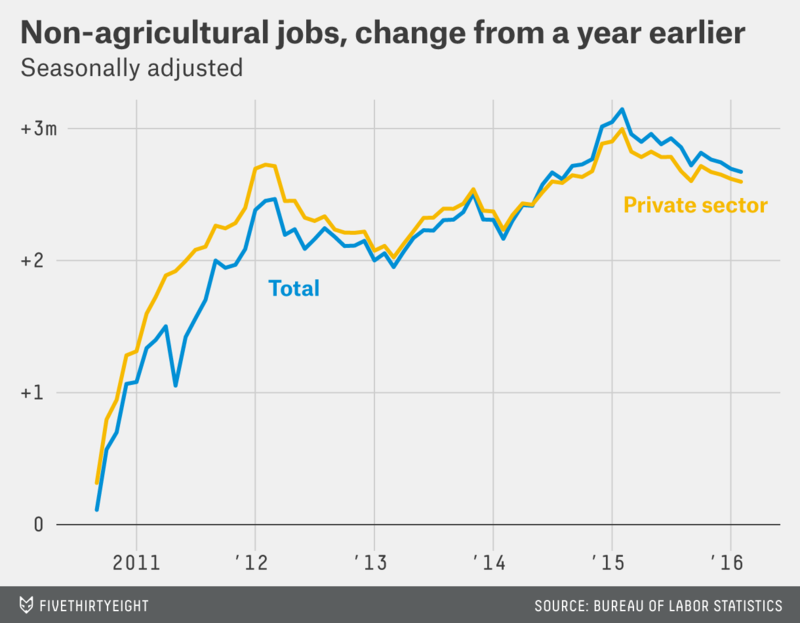 Over the slightly longer term, the pace of job growth has slowed a bit since early 2015. The U.S. has added 2.7 million jobs in the past year, down from more than 3 million a year ago. But don’t worry too much about the slowdown; if the recent trend continues, the U.S. will keep adding jobs for years to come. A tale of two economies: The jobs report was strong overall, but there are signs the global economic slowdown is taking a toll. The mining sector, which includes oil and gas producers, cut jobs for the 17th straight month amid falling oil prices. Manufacturers cut jobs, too — that could be a one-month blip but could also suggest falling demand from overseas is hurting U.S. exporters. The transportation and warehousing sector, which is heavily involved in global trade, also cut jobs. The domestic economy, on the other hand, remains strong. 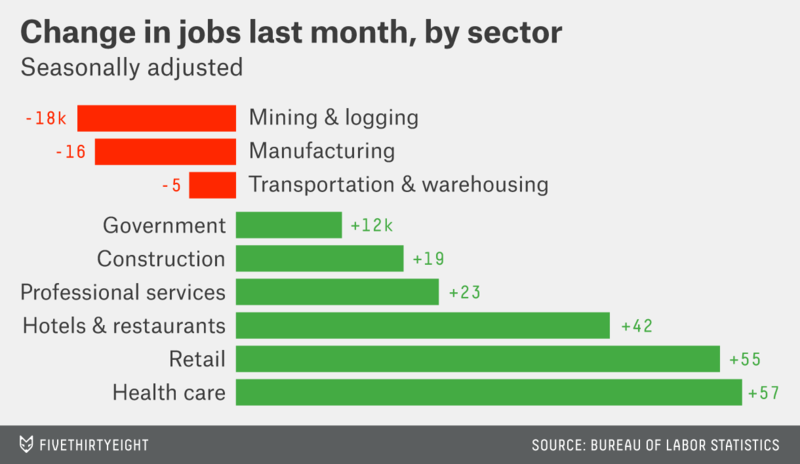 Retailers added nearly 55,000 jobs. Hotels and restaurants added 42,000. Professional services — law firms, advertising agencies and similar office jobs — added 23,000 jobs, and unlike in some months, the increase wasn’t driven by low-paying temporary positions. Fewer hours: One possible trouble spot in the report: The average workweek fell by 0.2 hours (about 12 minutes), the biggest one-month drop in more than two years. When the economy is strong, companies often ask employees to work more hours as a precursor to hiring. So falling hours could be a sign they’re seeing less demand for their goods and services. (Non-supervisory workers also saw their hours decline slightly.) A one-month dip may not mean much, but it’s worth keeping an eye on in coming months.